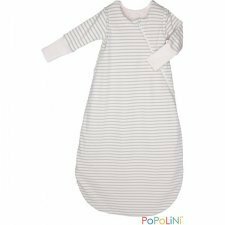 Sleeping bags for children from 6 months to 4 years of age, made exclusively from natural materials such as organic cotton and organic wool. 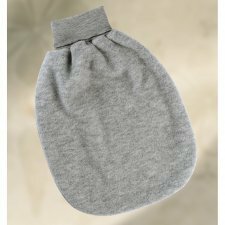 We have several models from Romper, to sleeping bags with or without sleeves, to the sleeping bag with detachable sleeves. Newborns need that feeling of closeness and safety. The time before birth means they connect this feeling with the protective snugness of their mother’s womb. Disana knitted woollen sleeping bag gives them this feeling of closeness and safety, making it the perfect bedtime accessory for babies and tiny tots. The high, stretchy knitted waistband gently embraces the child without pinching, while the wide leg bag leaves space for baby to wriggle about. Two wide knitted straps keep everything in place. 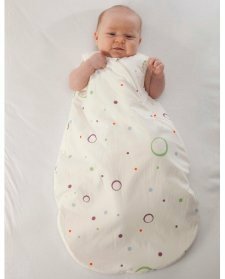 The sleeping bag design keeps baby well wrapped up and warm even when she has trouble sleeping. It is also perfect to swaddle up your baby snugly. The clever thing about our sleeping bag, however, is definitely the indescribably soft pure Merino wool: our disana knitted woollen sleeping bag shows off its natural softness and warmth especially well. Out of 100% organic Merino wool. Romper bag made from 100% organic cotton chenille and organic cotton jersey lining. Fit from 0 to 6 months. Available in natural white, pink or blue. Newborn romper bag made in 100% organic cotton light jersey. Fit from 0 to 6 months. Sleeping bag made from 100% organic cotton, the inner side is soft 100% organic cotton plush. Ideal in homes with temperature below 20 ° C. Handy zip with hidden cover. Detachable sleeves. Newborn romper pouches made from 100% organic merinos wool fleece. Mashine washable! Size: 80x45 cm (approx from 0 to 12 months). Made in Poland with european wool. Sleeping bag, the only way to ensure that the baby doesn't uncover while sleeping. Model with sleeves closure with side zipper and neckline button closure. 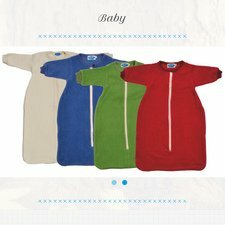 made outside in 100% organic cotton fleece and lined in organic cotton. Indicated for the mid season or also in winter suitable for houses well heated over 20° C.
The price changes with the size. Model without sleeves closure with side zipper and neckline button closure. made outside in 100% organic cotton fleece and lined in organic cotton. Top for sleeping bags in one size. Fits babies in sleeping bags from 70 to about 110 cm. Made of 100% organic cotton fleece. The Manga Baba looks like a vest, but has no front. Ideal for those who use a sleeping bag without sleeves, but still would like to have the arms warmer. Can also be used as a warming addition in the colder months. One size. Available in natural white. Sleeping bag without sleeves made from 100% organic cotton, the inner filling side is made of 80% virgin wool and 20% Ingeo™ (polylactid). Ideal in homes with temperature below 20 ° C. Handy zip with hidden cover. Colour: white with coloured bubbles, mini-striped blue/white or light green.